Hooked up to a drip, wearing just a nappy and a forlorn expression, the tiny infant stares out through the bars of his cot at the frenzy of activity around him. A few feet away, a nurse makes up a bottle of formula while another prepares a bath. On a nearby table lies a thermometer, a blood-pressure gauge and bottles of medication. The scene is typical of any infant care unit and the staff are dedicated to saving their tiny patients. The only difference is that these 'babies' are not human but infant orang-utans. Situated in the heart of the Malaysian jungle, the Infant Care Unit at Bukit Merah Lake Town Resort - dubbed Orang-Utan Island - is a very special hospital. 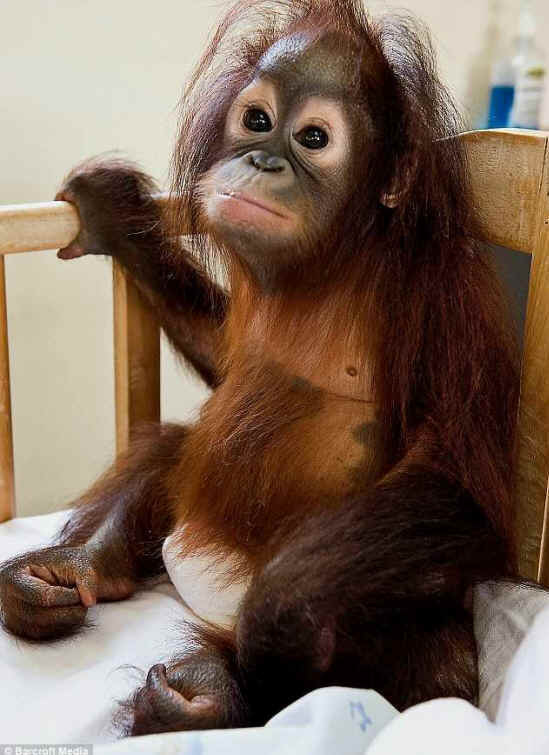 All of its patients are from the endangered Borneo species of orang-utans, the Pongo Pygmaeus. Without the facility, built in 2004, the species would probably be extinct. Many of the 23 baby orangutans treated here were rejected or abused by their mothers. Without milk, they develop severe malnutrition. In hospital, they are cared for just like human babies. Every two hours the patients are bottle fed, and their vital signs are monitored - including blood pressure, blood oxygen content and pulse. Bed is a cozy cot, with blankets and pillows, while incubators are reserved for those who have particularly low body temperatures. Each morning, the baby orangutans are sponged with antiseptic body wash and weighed. They are also monitored by vets, who make sure they have the required 15 to 22 hours of sleep a day. Two of the current patients are typical of those cared for since the unit opened five years ago. When they are a year old they will be moved to the infant development unit, where the animals are taught how to survive in the wild. 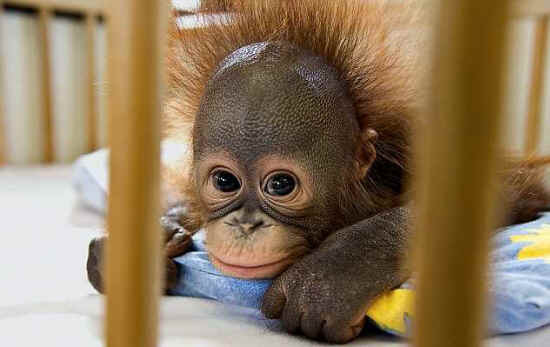 The World Wide Fund for Nature (WWF) says there are only 3,000 Borneo orang-utan left in the world. But thanks to the tender care administered to babies such as June-Junior and April, this decline could be halted. A dedicated team of seven nurses care for the creatures, headed by one of Malaysia's most experienced vets. 'We have a total of 23 orang-utans here at the Bukit Merah resort,' said Dr. D. Sabapathy. 'We work with the state government of Sarawak on the island of Borneo, who send us ill or abandoned orang-utans that we care for here. 'The ultimate plan in the next year is to enact the return of our 23 apes to the wilds of Borneo, into a secret location. The low birth rate of orang-utans and encroachment on their natural habitat has seen the species' population dwindle. Recognized as an endangered species, the Borneo orangutan is estimated to number between 45,000 and 70,000 in the wild. 'April was rejected by her mother, who was very aggressive towards her,' said Dr. Sabapathy. 'She will stay inside the ICU until she is almost one-year-old and then she will be moved to our Infant Development Unit. There she will be taught how to survive in the wild and gradually her human contact will be cut to a bare minimum. 'June-Junior was a more serious case as she was born weighing just 1.1kg and had developed respiratory problems. Priding themselves on their commitment to conservation as well as informing the public of the plight of the orang-utan, the Bukit Merah park is one of Malaysia's largest eco-tourism resorts. 'Without the specialist care that we offer in our ICU I would not be so confident of June-Junior's and April's survival,' explained Dr. Sabapathy.